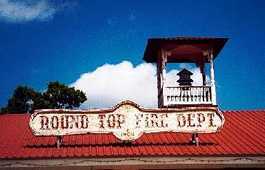 Round Top Texas and Round Top Area Hotels. 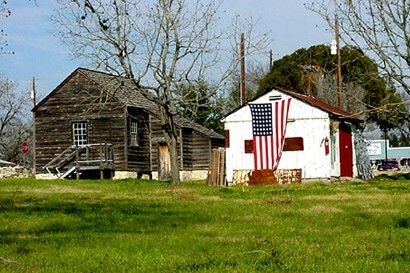 Round Top's beginnings are similar to other towns in Fayette County in that the original settlers were English and sold their land to German newcomers. 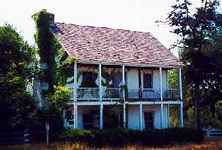 The Stephen Townsend family left Florida in 1826 (in 1826 Florida about all you could do was leave) and came to what is now Fayette County. 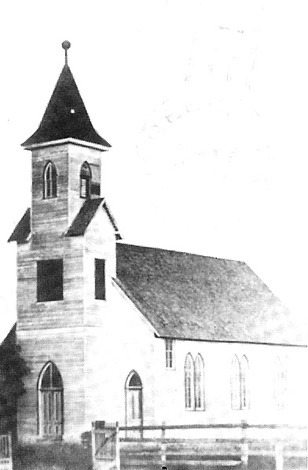 The Townsends, with the help of neighbors, set up a Presbyterian Church and organized a Masonic Lodge. 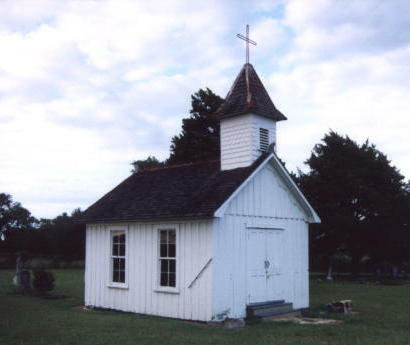 The church and the Townsend family's former residence explains the name Florida Chapel Road and Florida Chapel Cemetery found just South of town. 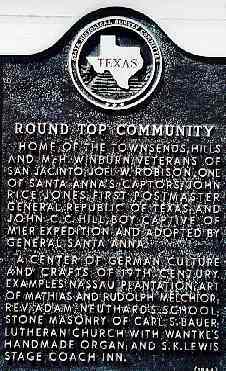 Round Top historical marker on public square, Washington St.
Home of the Townsends, Hills and McH. 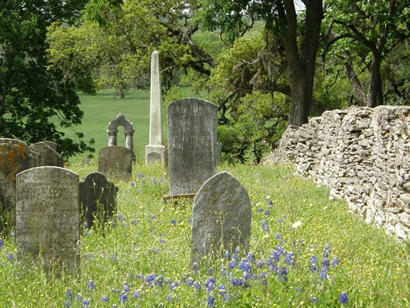 Winburn, veterans of San Jacinto; Joel W. Robison, one of Santa Anna's captors; John Rice Jones, first postmaster general, Republic of Texas; and John C.C. Hill, boy captive of Mier Expedition and adopted by General Santa Anna. 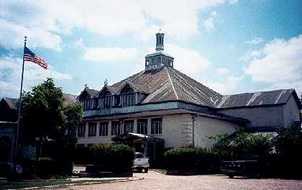 A center of German culture and crafts of 19th century. 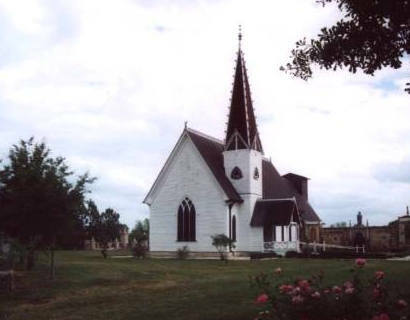 Examples: Nassau Plantation; Art of Mathias and Rudolph Melchior; Rev. 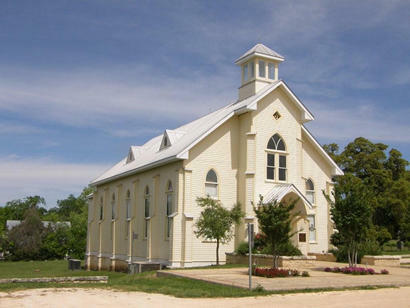 Adam Neuthard's School; Stone Masonry of Carl S. Bauer; Lutheran Church with Wantke's handmade organ; and S. K. Lewis Stage Coach Inn. On the Old San Felipe Trail, in memory of John C. Robison, participant of the Battle of Velasco; Joel W. Robison, McHenry Winburn, Isaac Lafayette Hill, Spencer Burton Townsend, Stephen Townsend, Veterans of San Jacinto; J. T. Townsend, John P. Townsend of the San Jacinto Campaign; Mayers Fisher Jones of the Santa Fe and Snively Expeditions; John Rufus Alexander of the Mier Expedition, and other Pioneers who resided in the vicinity. 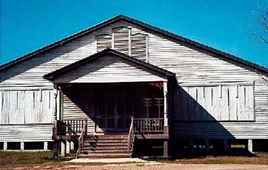 The original name was Jones Post Office and named after the town's postmaster John Rice Jones Jr. who also happened to be the first postmaster general for the Republic of Texas. 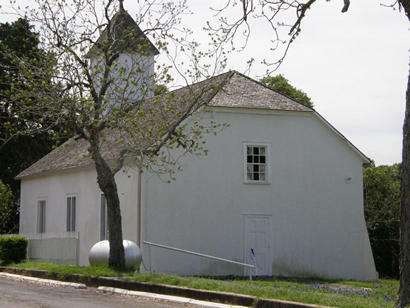 Later, a house with a tall octagonal tower served as the post office and since the tower's "round top" could be seen from a distance, the name gained acceptance. 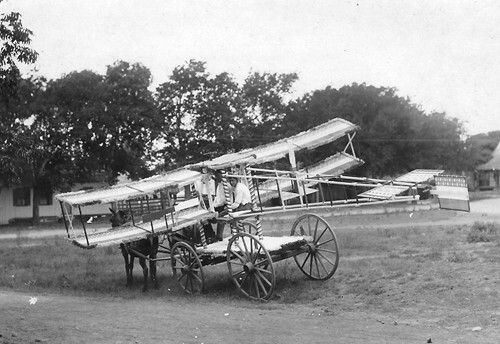 For years Round Top has been an attraction for city dwellers - particularly Houstonians. 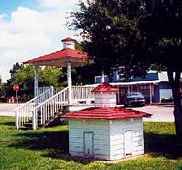 Many bed and breakfast facilities are available as well as antique stores and restaurants. 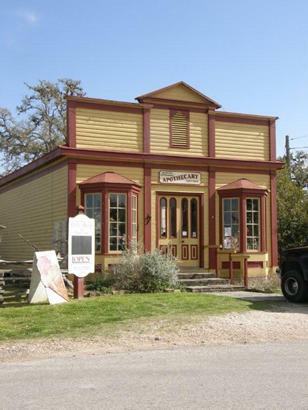 Winedale Historical Center - 4 miles East of Round Top. FM 1457 and FM 2714. 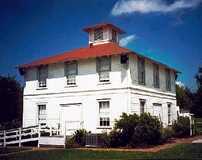 A former stagecoach stop and farmstead that was bequeathed to the University of Texas by Miss Ima Hogg. Group tours are available during the week with two days notice. Saturdays and Sundays 10:00 a.m. to 5 p.m.
Last weekends in March and September, and first weekends in April and October. at the International Festival Institute. We checked with the Round Top chamber of commerce and they said that one of their people just recently went door-to-door and counted 90 persons (May 15, 2001). They believe the Census Bureau counted 91 - but you can't rely on census enumerators. The Official State Travel Guide says 96 and so does the Official State Map. Texas State Data Center's figure as published by Texas A&M is 77. 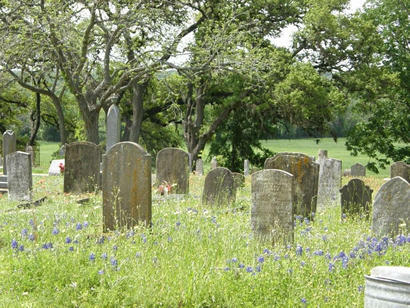 One thing is for sure - if you need exactly 100 people for something - don't look for them at Round Top.